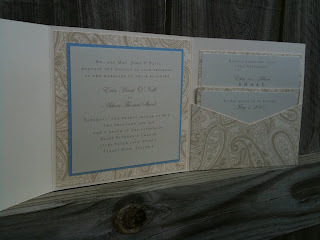 We just finished production on Erin & Adam's wedding invitations. 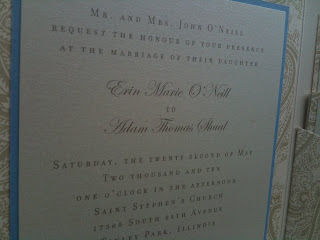 Erin was looking for elegant wedding invitations, including the reception card and response card. 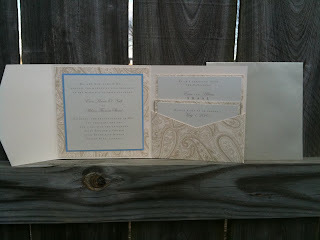 She wanted them to be classy with ivory, pearl, and champagne. She also requested a touch of light blue in them. 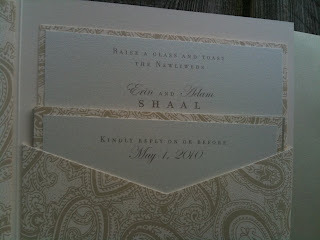 We suggest our Pearl Regalia Invitation, with a slight modification on them to include a backer card in "Wind". Erin even personalized it a bit more by supplying is with custom stamps she ordered from Zazzle. They turned out so beautifully! Each layer in shimmery and they really sparkle. 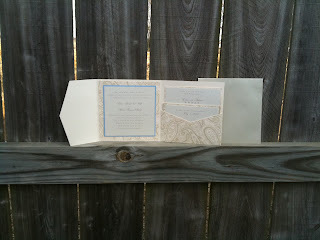 What a way to kick off a great 2010 bridal season! Those are GORGEOUS! I love the paisley background/ holders.